Sorry for all the baby-related posts in a row. As you can imagine, it's the main thing on my mind nowadays. So why not cover something baby and technology related? 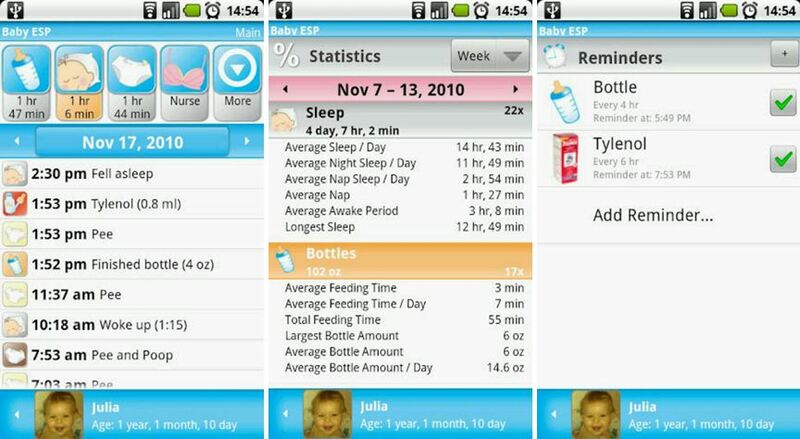 Presenting... A Gamer's Wife's list of Top 3 Pregnancy and Baby Android Apps for 2012 (ordered by when you need them, not by awesomeness ranking)! Apparently, around the third trimester, your developing baby should be kicking, punching, and prodding your internal organs at least 10 times in two hours. Dexter has been always quite the active fetus so my doctor never asked me to track his movements, but this simple app gave me some peace of mind (and private bragging rights). Since your baby has been happily exercising his right to find an exit hole out your belly button, it's only fair that your torso should respond in kind by trying to squeeze the stuffing out of him point him in the right direction. Want to know if it's time to introduce your baby to the world? 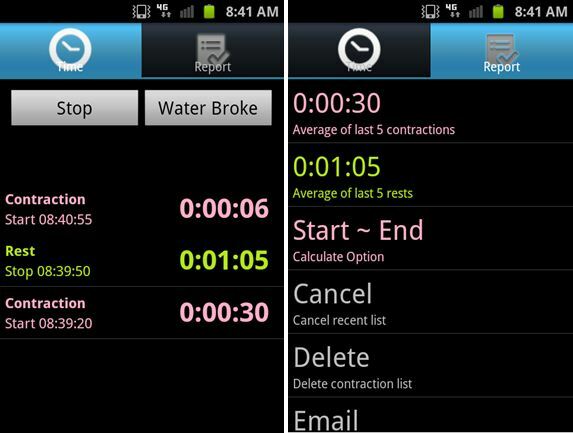 This app can help you keep track of whether or not you've got false or true labor contractions (just remember the 5-1-1 rule). Now that your newborn has safely arrived in the world, your pregnancy worries turn to parenting worries. Is my baby eating enough? Is it normal to poop twice a day? How does his growth compare to others at this age? If you can believe it, people used to have to record this stuff using paper and pen. No more! 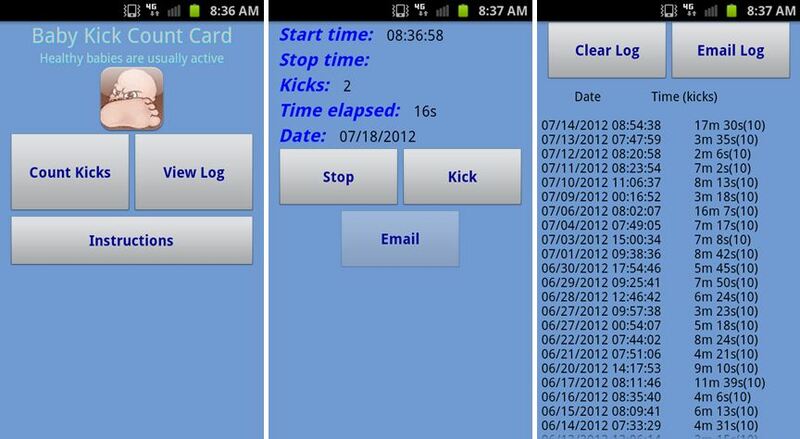 Now you can track everything with the flick of a finger, email and print out graphs for your doctor, and even set alarms to remind you when to administer medication. Oh, and did I mention there's a cool feature that allows you and your hubby to synchronize data across multiple phones for the same child? I wanted an app that would tell me to do prenatal exercises every day, and found the Android market to be woefully lacking. While I could have just printed out a list from the Internet, I wanted something always accessible on my phone, and these still photos are easy to understand immediately, compared to text and videos. While it's probably not worth $2.99, I did end up using it throughout my pregnancy so figured I would mention it. I can't comment since I had my first baby 9 years ago (feels like the dark ages now!) I had a nifty nursing bracelet that sort of helped me remember which side I used last when I remembered to use it. Since my oldest had developmental delays I very quickly threw the calendars and charts out the window and started celebrating every little thing he did in his own time and didn't beat myself up too much that he wasn't on schedule. That trickled down to my other two and we just went with the flow. I am a firm believer in the "Look at your baby, not the clock/calendar/app" philosophy. That being said, you might want to load up on some podcasts or audio books or get yourself some Netflix to enjoy while you are tethered for hours to your sweet little Dexter for marathon nursing sessions. The yoga pose you showed in the screencap of your exercise app was a favourite of mine. It is really good to get your baby in a good position while taking pressure off your lower back.